Panasonic has just gotten around to releasing their next Micro Four Thirds camera, and it looks awfully familiar! That's because the GH1 is, more or less, the G1, with added 1080p HD video capabilities. In fact, it looks as though allthe GH1's changes revolve around that single new feature, which was sorely missed in the G1. But first, about that HD: the camera will record full, 1080p video at 24fps in the relatively common AVCHD format, or 720p content at an buttery 60fps, framed through either the new digital viewfinder or a flip-out, 3-inch LCD screen. Checking out some of the video they're demoing, it's definitely impressive and—other than the depth of field control for sharp subjects and soft backgrounds—indistinguishable from any other 1080p camcorder, at least in daylight—they're not showing any night footage though. 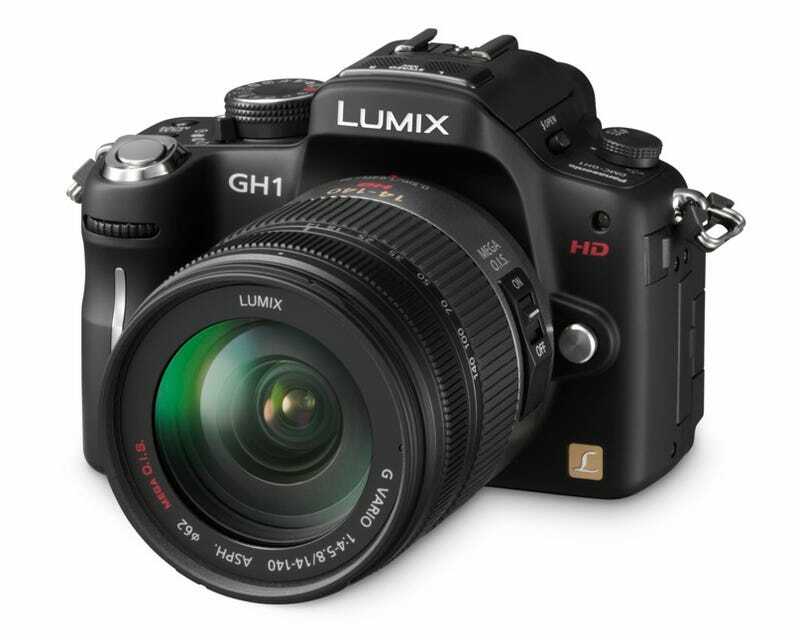 To bolster video performance, Panasonic is bundling the GH1 with a video-optimized 14-140mm/F4.0-5.8 lens. What qualifies the lens as "optimized", apparently, is the autofocus system: the smooth, continuous AF is driven by a silenced motor to minimize sound pollution during video sessions. To round out the video capabilities, Panasonic has included a "Creative Mode", which provides aperture and exposure control during video recording—a capability that is conspicuously absent from some pricier video-enabled DSLRs. As far as still shooting goes, the GH1 isn't meaningfully differentiated from its predecessor, so you can get an idea of what to expect in our G1 review. Check the presser below for full details. Las Vegas, NV (March 3, 2009) – Panasonic today introduced the DMC-GH1, the newest member of the company's revolutionary LUMIX G Micro System – a new digital interchangeable lens camera system that delivers professional-level features and performance in a compact and easy-to-use camera body. "Photographers of all levels – professionals, amateurs and beginners – will be stunned by the range of creative possibilities that the LUMIX GH1 creates in the world of high-quality photography and HD video. Users will be equally amazed by the camera's easy-to-use design and small size," said David Briganti, National Marketing Manager, Imaging, Panasonic Consumer Electronics Company. "Beyond its creative potential, the LUMIX GH1, a sister product to the award-winning LUMIX G1, is also innovative and differentiates itself from the pack by recording High Definition video with continuous AF, an indispensable feature for practical video recording." In addition to the digital camera's HD video recording capability, the DMC-GH1 features the LUMIX Creative Movie mode which lets the user manually set the shutter speed and aperture, making their videos more creative and representative of their own personal video style preference. Changing the shutter speed gives the videos a special look, particularly suitable for shooting fast-moving subjects. Controlling the aperture is convenient when there are several subjects at varying distances, so the user can focus on the foreground and blur the background – or vice versa. While the LUMIX DMC-GH1 has cutting-edge still image and video capture features, the LUMIX GH1 is also incredibly easy-to-use, thanks to Panasonic's iA (Intelligent Auto) mode** – a user-friendly setting made popular in the LUMIX line of digital point-and-shoot camera products. Panasonic's iA mode is a suite of technologies which engage automatically (no settings needed). The latest addition to the iA suite of features is Face Recognition, a feature that directs the camera to prioritize focus and exposure on a specific face that that the user had previously registered in the camera. *** This invaluable function makes it especially easy to take sharp and beautifully exposed images of things the user values most in their photos – the user's friends and family. Panasonic's iA mode offers other innovative features which help deliver consistently outstanding photos: O.I.S. (Optical Image Stabilization) to help reduce blurring from hand-shake; Intelligent ISO Control to help limit motion blur by adjusting the ISO sensitivity if the subject moves as the shot is taken; AF Tracking that lets the camera lock onto any subject and keep it in focus even if it moves; Intelligent Exposure which optimizes the exposure for each part of an image, preventing blocked shadows and blown highlights, and helps ensure that gradation and details are reproduced beautifully; and Intelligent Scene Selector which automatically detects the five most common shooting situations - Portrait, Night Portrait, Scenery, Night Scenery and Close-up - and switches to the appropriate Scene mode. Best of all, the benefits of Panasonic's iA mode extend to motion image recording on the DMC-GH1. For example, the LUMIX GH1 motion iA includes O.I.S. and Face Detection, which automatically detects a face in the frame and adjusts focus, exposure, contrast, and skin complexion. Intelligent Exposure continually checks the ambient light level and adjusts the exposure setting as conditions change to prevent blown highlights and blocked shadows. Intelligent Scene Selector automatically switches between Normal, Portrait, Close-up, Scenery, and Low Light modes according to the environment. After users capture their images using the LUMIX GH1, it's easy for them to enjoy their photos or HD videos immediately on a large-screen Panasonic VIERA® high-definition television. All that is required is to remove the SD Memory Card from the LUMIX GH1 and insert it into the VIERA Image Viewer (SDHC/SD Memory Card slot) located in the VIERA HDTV or in the Panasonic Blu-ray disc player. Alternatively, an optional mini HDMI™ cable is available to output the images from the LUMIX GH1 directly to the Panasonic HDTV via VIERA Link™. Then, using the VIERA HDTV's remote control, users can take advantage of the LUMIX GH1's advanced playback and slideshow features.